Four square miles of beaches and small village appeal, yet still close to it all. The town of Southern Shores has all the secluded charm of the neighboring Northern Outer Banks villages of Duck and Corolla, but with easy (and even walking-distance) access to the busy central Outer Banks' treasure trove of restaurants, shops and attractions. A combination of rich maritime forests, quiet residential beaches, and a handful of restaurants and shops, Southern Shores is an ideal vacation locale for families who want to be away from it all, but still remain close to the big Outer Banks attractions. The town borders of Southern Shores appear to run seamlessly into its southern neighbor Kitty Hawk, and for good reason. For decades the area was simply a part of Kitty Hawk, and it wasn't until the early 1940s when a parcel of the area that consisted of Duck Woods, Kitty Hawk forest, and oceanfront beaches, was designated as a future resort. The "Resort of Southern Shores" was officially founded in 1946, and become an actual town a little more than three decades later in 1979. Back when Southern Shores was still a part of Kitty Hawk, it was home to one of the US Lifesaving Service's original Outer Banks stations, the Paul Gamiels Hill Lifesaving Station, which was built and manned in 1878. After a remodel in 1909, it served as an instrumental station for both World Wars, but it was soon after deserted and replaced with the modern OBX Coast Guard facilities, and eventually burned down in the 1960s. Visitors to Hillcrest Drive beach access, where the station was located, will find little evidence that it was ever even there. Even though Southern Shores had clearly joined modern times, with a small shopping center that features a pizza shop, Chinese food restaurant, ice cream store and even a smoothie shop, vacationers will find it offers miles of peaceful privacy. Vacation rental homes in this area range from small wooded cottages and 1-story ranch houses, to sprawling 8-9 bedroom oceanfront beach mansions, complete with private pools, game rooms, hot tubs, and miles of views. There are no motels or hotels in Southern Shores, but vacationers will certainly find plenty of vacation rental homes, for all family sizes, to choose from. As for the beaches, vacationers can expect endless quiet beaches with plenty of room to spread out. Like all villages of the central and northern Outer Banks, the town of Southern Shores has its own unique set of rules for shore side visitors. Most notably, dogs are not permitted on the beach during the summer season from 9:00 a.m. - 6:00 p.m. and beach equipment, such as tents, volleyball nets, or canopies, are not allowed to remain on the beach overnight. But vacationers can rest assured that the beach rules and restrictions are limited, and can happily expect hours of oceanfront fun. The Southern Shores beaches do have lifeguarded patrols, and also operates a red-flag system in inclement weather, so visitors can rest safe knowing that the beaches are well watched. Off the beach, visitors will find an extensive walking path that runs parallel to the two-lane NC Highway 12, the only main road that spans across the village towards the northern Outer Banks towns of Duck and Corolla. This walking trail is shaded by acres of live oaks, cedar trees, yaupon and myrtle bushes, and allows vacationers to get a glimpse of the local maritime forest environment without straying too far from the oceanfront. As a result, many of the soundside homes in Southern Shores offer plenty of privacy, as well as shaded woodsy decks, which are ideal lounging locales on hot summer days. 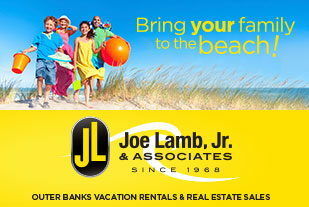 To stay close to the Outer Banks action, yet still enjoy miles of seclusion, little development, and a wide selection of vacation rental homes and quiet, open beaches, Southern Shores may just be the perfect vacation destination to enjoy the serenity of the OBX, as well as all the attractions. Where is Southern Shores, NC? 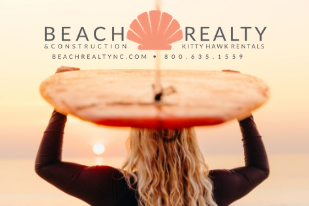 Southern Shores is located in the central Outer Banks, and is sandwiched in between the towns of Duck to the north, and Kitty Hawk to the south. How do you get to Southern Shores, NC? Visitors can reach Southern Shores from the northern mainland via the Wright Memorial Bridge. From southern areas, Southern Shores can be reached via the Beach Bypass / US 158. What is there to do in Southern Shores, NC? Southern Shores is best known for its beaches. 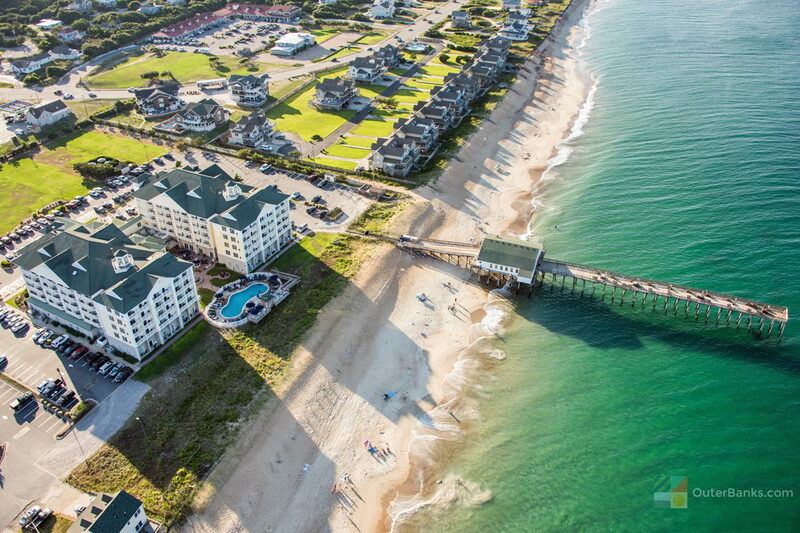 Comprising of mostly vacation rental homes with very little commercial development, the town has one of the lowest-density summer populations along the shoreline in the central Outer Banks. In addition, the town is close to two golf courses, (Duck Woods County Club and Sea Scapes Golf Links), as well as a handful of shops and restaurants. There are also bike paths throughout Southern Shores that follow scenic neighborhoods and / or beachside streets. What are the special events in Southern Shores? Restaurants and shops in Southern Shores often host regular events in the summer months, such as weekly wine or beer tastings, or live music on the weekends. The town is also close to several big annual events in the area, such as the Duck Jazz Festival in October, and the Annual Celebration of the Wright Brothers First Flight at the Wright Brothers Memorial in December. Where are the beach accesses in Southern Shores, NC? 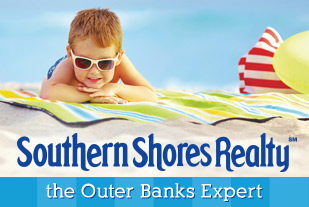 Multiple vacation rental homes have instant access to the beaches in Southern Shores. In addition, there are two larger access areas for beach-goers at Hillcrest Drive and Chicahauk Trail. Property owners and their guests are eligible to receive permits from the town to park in sign-designated parking areas near beach accesses. Unless otherwise marked, parking is not allowed on any street or street right-of-way in the town of Southern Shores. Are there lifeguards in Southern Shores? Southern Shores has four beaches with seasonal lifeguard stands, which are found at Hillcrest Drive, Chicahauk Trail, East Dogwood Trail, and 142 Ocean Boulevard. In addition, lifeguards patrol the beaches on all-terrain vehicles from May through September. What are the attractions in Southern Shores, NC? Southern Shores is distinctive for its network of bike paths, as well as its golf course – the Duck Woods County Club – and pristine beaches. The town is also close to several local landmarks including the Wright Brothers Memorial in Kill Devil Hills, and the Kitty Hawk Woods Coastal Reserve. 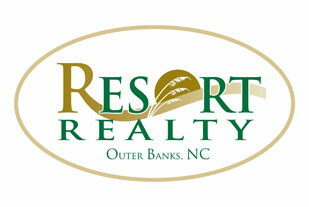 Are there shops and restaurants in Southern Shores, NC? There are a number of shops and restaurants in Southern Shores, which are generally found in small and central shopping plazas. In addition, the town is close to several big chain stores, grocery stores, and additional shops that are found next to the entrance of the Wright Memorial Bridge in Kitty Hawk. 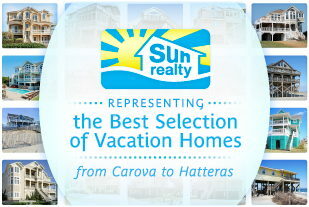 Where do you stay in Southern Shores, NC? Visitors to Southern Shores can stay in vacation rental homes, which are located throughout the town, and which can range from 2-3 bedroom cottages to 8 or more bedroom homes. There are no campgrounds or hotels / motels directly in Southern Shores, however the expansive Hilton Garden Inn in Kitty Hawk straddles the town’s border. What can you do on a rainy day in Southern Shores, NC? Southern Shores is home to a collection of unique shops and boutiques, restaurants, and the Outer Banks’ own “Escape Room.” In addition, the town is close to Duck, (which is a famed shopping destination on the OBX), as well as indoor amusement centers and laser tag arenas in the central Outer Banks. Are pets allowed on the beach in Southern Shores, NC? Dogs are allowed on the Southern Shores beaches in the evenings from 6 p.m. until 9 p.m. from May 15 until September 15. Dogs must be on a leash at all times, and owners must clean up after their pets. Can I drive on the beach in Southern Shores, NC? Driving is not allowed on the Southern Shores beaches all year long. Are there shells in Southern Shores, NC? The Southern Shores beaches can have decent shells for beachcombers, particularly after a storm or a passing offshore hurricane. Because the beaches are uncrowded throughout the year, beachcombers will have little competition when it comes to shelling. Are beach bonfires allowed in Southern Shores? Beach Bonfires are not permitted in the Town of Southern Shores. When is the best time to visit Southern Shores? The summertime is considered to be peak season in Southern Shores, especially the months of July and August when water and ocean temps are at their highest. The fall and spring seasons are also gaining in popularity, due to exceptional fishing and reduced rates on accommodations. What are the average air temperatures each month in Southern Shores? Come see epic battles and Indian dances. Experience the sorrow and heartbreak of tragedy and loss. Witness the pageantry of the Queen and her court and celebrate the birth of Virginia Dare, the first English child born in America. The Lost Colony, Paul Green’s Symphonic Outdoor Drama, has been performed each summer since 1937 on the same site where these actual events occurred. Under the direction of Ira David Wood, III, a company of over 100 actors, dancers, singers, and technicians create a magical evening for your whole family.